We’re celebrating Day #6 of of the Bloggy Birthday Bash with the modern and sleek Astro high chair by Valco Baby! Read on to find out what we think of the Astro High Chair and how you can get your hands on one! Perfect for today`s urban lifestyle, the chic Astro high chair simply does what a compact high chair should to do…with style! 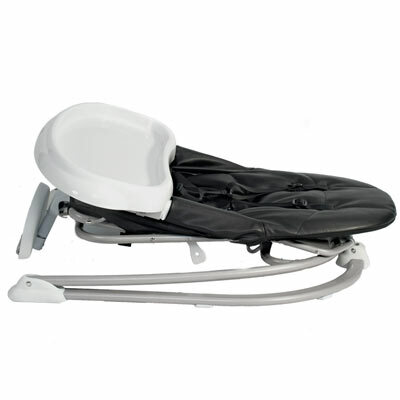 With it`s large and super soft easycare leatherette seat and deep adjustable/removable tray, the Astro sits on a stable yet compact base. The simple effectiveness of our unique fold system means the Astro collapses flat for easy storage! - Flat Fold – Yes this high chair folds flat! With a simple lift of a lever the high chair folds flat on the floor for quick on-the-go convenience or storage. 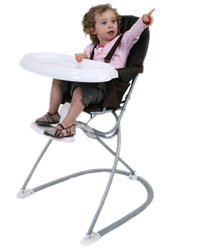 - Easy on and off tray – Sure many high chairs claim to have a tray that easily comes on and off, but not quite as easily as this one. Two levers underneath the tray can be pushed up with just the touch of the finger and glides off with ease. Placing the tray back on is as simple as pushing it! The seat material is typically referred to as “leatherette”, however if I could describe it to you, I would say that it “feels” like a mix of leather and vinyl. Now at first I wasn’t too sure of the seat fabric, however after using it just one day, I can see why Valco Baby chose to use this type of fabric. Food doesn’t stick to it and this is the easiest to clean out of all the “cushioned” high chairs we have owned. Now I’m left to wonder why we’re not seeing this material on more high chairs! The Astro high chair comes equipped with a 5-point harness system to keep little one’s safe and sound, as well as a T-strap that is built right into the chair cushion. This gives little one’s a little more added security and keeps them in place during meal time. The Astro’s lightweight nature makes it a perfect option for travel and the rubber pads at the bottom of the high chair ensure that you can drag this high chair to multiple locations throughout the house without the need to lift it. In fact, this is one of my favorite features as Lil’ Pea’s choice of eating locations changes daily! With it’s modern design, super compact fold, and unique choice of material, the Valco Baby Astro high chair is one chair you’ll want to take a closer look at! With plenty of room for baby to grow, deep and easy “on and off” tray, as well as a 5-point harness system, this high chair truly offers all of the features that parents are looking for in an “at home” or “travel” high chair. The Astro high hair by Valco Baby comes in 4 colors and is recommended for children 6+ mons. Retailing for just $149.99, the Astro is a real bargain for a modern designed high chair! 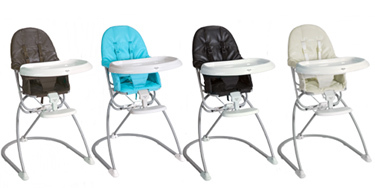 You can purchase the Astro high chair at multiple online retailers or find a store near you! One Lucky “Deal”ectible Mommies reader will WIN a Valco Baby Astro High Chair! Simply visit Valco Baby and sign up for “News” (located at the bottom right of the homepage) and your entered to win! Extra Entries: Please Note that the intial entry must be completed before any extra entries will be counted and you MUST leave separate comments for each extra entry completed! 3. Subscribe to my feed or emails (located on the right hand sidebar). The Boring Stuff: Giveaway will end on September 7th at midnight! Winner will be chosen at random. Disclaimer: Valco Baby provided me with an Astro high chair to facilitate my review. My thoughts and opinions remain my own! Holiday Gift Guide Linky: Share Some Holiday Love! Signed up for Valco News! Fan of you on FB! I signed up for the Valco Baby News. Thanks, nice giveaway! I subscribe to your feed! I like Valco Baby on FB! I’m following Valco Baby on Twitter! I subscribed to Valco Baby News. I signed up for Valco news! I signed up for Valco Baby’s News! I like Valco Baby on FB. I’m following Valco Baby on Twitter. liked Valco Baby on Facebook! Signed up for Valco Baby News. I ‘like’ u on facebook. I subscribe to ur emails. Follow Valco Baby via Twitter. I am a fan of you on facebook. I like Valco Baby on facebook. I signed up for Valco baby news! Signed up for the “news”!! I signed up for the Valco Baby newsletter on their website. Already a “Deal”ectible fan on Facebook! I follow you on twitter, and tweeted! I signed up for the valco baby news! I signed up for Valco Baby news. I fan you on facebook. I like ValcaBaby on facebook. I follow ValcoBaby on twitter. I signed up for email list! I follow valco baby on twitter! I am a fan of “Deal”ectible Mommies on Facebook. i like valco baby on fb. amy bolda pugmire. i follow valco baby on twitter. 1amypugmire. I signed up. I want to win this for my sister. She’s pregnant and has the smallest kitchen EVER. She needs a chair like this! I signed up for news!! Im a fan of Dealectible Mommies on FB. I signed up for news from Valco Baby. I also subscribed via email to your blog the other day. I “Liked” Valco Baby on Facebook. I subscribe to your blog on google reader. I put the birthday bash button on my blog and wrote and entry about it. I follow baby valco on twitter. I signed up for their newsletter! I love Valco Baby. I have been lusting after their Valco Baby Twin Tri Mode stroller forever. I subscribe to your emails, thanks! I like Valco Baby on FB, thanks! I signed up for news on Valco. I signed up for the news! I follow on twitter and tweeted! I signed up to receive news from Valco Baby! Like “Deal”ectible Mommies on FB. I like you on FB as Felicia King. I signed up for their newsletter. Thanks for the opportunity! Jessica´s last blog post ..Go! Fabric Cutter Giveaway Alert! I Like Valco Baby on Facebook as Felicia King. I follow Valco Baby on Twitter as pbandjmama. I signed up for Valcro news. I’m a fan of yours on FB. I subscribe to you via email! I signed up for the news! Such a cool and modern looking highchair. I love it!!!!!!!!! I’m a fan of yours on fb And I love it!!!!! I signed up for their news! What a great line of products! i signed up for news. great giveaway! Susan C´s last blog post ..My new grandson! I follow you on twitter and tweeted as ptowngirl. Holly Henderson´s last blog post ..Makeup Madness! I follow “Deal”ectible Mommies on Twitter and tweeted. I am monkaroo. I subscribe to the valco! I am a FB fan of you! I am a Valco Baby News Subscriber as jweezie43[at]gmail[dot]com. I am following Valco Baby via Twitter as jlsc123. I am a fan of Valco Baby via Facebook as Jill Myrick. I signed up for the “news” on the Valco website! I visited and signed up. I subscribe by RSS in my feed reader – FeedDemon. I subscribed the to the NEWS on the Valco website. I follow you on Twitter and I tweeted the message. I follow Valco Baby on Twitter @acrook1. I signed up for Valco news. I signed up for their newsletter! I like u on facebook. I am a fan of you on FB. I “liked” Valco Baby on FB. Karine Traverse´s last blog post ..Paint Easily with Glidden Paint! I signed up for the Valco newsletter. I follow dealectibles on facebook. I subscribe to you with google reader. I like “Deal”ectiblemommies on Facebook. I like ValcoBaby on Facebook. Signed up for Valco news. Thank you for entering me! Thanks again for entering me! Sonya´s last blog post ..MIA- for a good reason! Signed up for the “news” thanks! I signed up for their news. I signed up for their “News”! I like “Deal”ectible Mommies on Facebook. I signed up for Valco’s news! Fan of Valco on FB!